Lifestyle diseases have been one of the most hectic headaches for the people today due to their unhealthy and tedious lifestyle. The present lifestyle can invite many diseases, and also, the lifestyle diseases do not leave you so easily once captured. 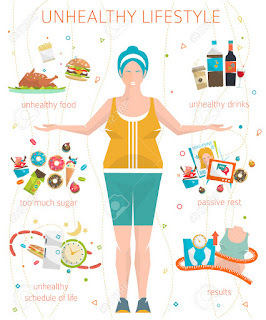 Lifestyle diseases are the diseases that are caused by the irregular and unhealthy lifestyle which includes lack of exercise, over-consumption of junk food etc. The irregular working schedules, improper working postures, and the intense stress are also prime reasons for lifestyle diseases. The hectic lifestyle due to the imbalance in work and personal life is another major issue. The most common lifestyle diseases are high blood pressure, cholesterol, heart diseases, PCOS, cirrhosis, liver damage etc. The key to escaping from the lifestyle diseases is to maintain a very healthy and disciplined lifestyle as well as to have effective checkups and diagnosis at regular intervals of time. While the whole world is busy building his/her own empire, it would be the best and wise to spare an ample time to yourselves, to review your health conditions. 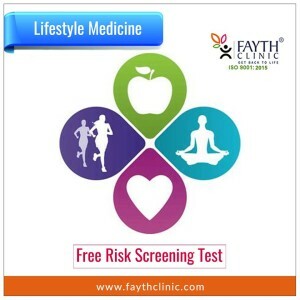 Fear not, for we, Fayth Clinic is your best partner in the health check-ups for lifestyle diseases. We, at Fayth clinic, makes it possible for you to get your medical check-ups done within a speculated time in an amount suiting your pockets. With the help of an efficient questionnaire that our experts prepared, we try to evaluate and decide the lifestyle diseases that have been troubling you. On the basis of the answers of the candidates, the level of lifestyle disease will be determined to be moderate, intense or light. On the basis of the results, the major lifestyle diseases faced by the patients are determined to start the treatments. We make it possible to bring these services available to you at very reasonable prices hence known as the best Lifestyle Disease Management Center Mumbai. Grab your appointment for lifestyle disease screening mumbai before its too late to lose your chance of the 20% offer exclusively for you, decrementing the MRP from Rs 7150 to Rs.5720. So, what is the delay? Fayth clinic is here waiting to serve you!